A new poll by Quinnipiac University has found that Americans “mostly disapprove” of the pending health-care reform bill by a substantial margin, and an overwhelming majority rejects the idea of public subsidies for abortion. The poll showed a 53- 36% margin against the legislation as a whole, and a much larger 72- 23% split against the use of public funds to pay for abortion. I just had to share this awesome book with you that a friend recommended and I have been reading to my son. 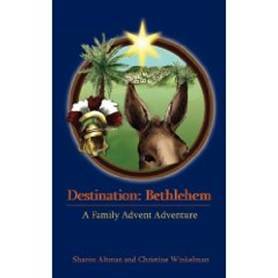 It’s called “Destination Bethlehem”. You are supposed to read a chapter a night during advent season. It’s a fictional story of a family traveling to Bethlehem for the census and meets up with a lot of the biblical characters. It also has maps and travel guides to the past. It has been so awesome to read since just coming back from all these places we have just traveled. For more information check out the website here.